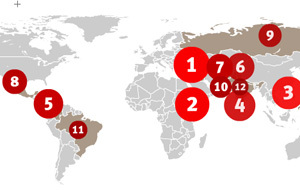 Map from CPJ's Impunity Index. One new resource from the Committee to Protect Journalists ranks countries by their failure to punish the murder of journalists; another offers advice on how not to become a victim. The Committee to Protect Journalists (CPJ) has released two reports that highlight dangers facing journalists around the world. CPJ’s 2012 Impunity Index shows that murders of journalists covering government corruption and other sensitive topics routinely go unpunished in democratic and nondemocratic countries alike. CPJ’s updated Journalist Security Guide and its new Journalist Security Blog provide detailed and practical advice on how journalists can assess and limit risks posed to themselves, their families and their sources. Iraq topped the 2012 Impunity Index with 93 unsolved journalist murders over the last decade. The index measures unsolved murders of journalists as a percentage of a country’s population and includes only those countries in which at least five journalists were murdered between 2002 and 2011 and no one was convicted. These murders make up 70 per cent of all work-related deaths for journalists and are distinguished from deaths in combat, for example. Iraq was followed in the Impunity Index by Somalia, Philippines, Sri Lanka, Colombia, Nepal, Afghanistan, Mexico, Russia, Pakistan, Brazil and India. Local journalists, not foreign correspondents, constituted the overwhelming majority of the murder victims. Only 13 of the 247 journalists murdered were working outside their own country. Politics was the most dangerous beat. The exposure of government corruption resulted in the murder of journalists not just in war-torn countries such as Iraq but also in democratic and stable Philippines and India. Threats preceded the murders in more than 40 per cent of the cases and in one in five cases, the journalists were tortured before they were killed. The 2011 murder of Mexican journalist Maria Elizabeth Macías Castro, who posted under a pseudonym on a social networking website and on Twitter about organized crime, was the first killing identified by CPJ as linked directly to a journalist’s social networking activity. http://www.cpj.org/blog/2011/09/mexican-murder-may-mark-grim-watershed-for-social.php The authors noted improvement in Colombia and Nepal as well as the removal of Bangladesh from the Impunity Index. Just like the Impunity Index, CPJ’s Journalist Security Guide contains many grim statistics. Worldwide, some 30 journalists are murdered each year. These murders are unsolved in nine out of 10 cases. Journalists face intimidation in the form of physical attacks and harassment. More than 150 journalists are imprisoned at any given time, sometimes with no charges brought against them. The whereabouts of at least 35 journalists are unknown. The authors of the Journalist Security Guide argue that through careful planning and constant risk assessment, journalists can improve their safety at home and abroad. The guide covers everything from basic preparedness and data protection with chapters on armed conflict, organized crime and corruption and natural disasters. The guide also includes a check list of items journalists should always carry, as well as information about health insurance providers, security training and journalism organizations around the world. Some of the guide’s advice will strike the reader as plain common sense: carry bottled water in areas where the water supply is iffy. Or: In case a journalist is detained or kidnapped, his captors are very likely to “Google” him, so it is important to be aware of one’s online presence and to be prepared to be interrogated about those publicly-available findings. However, there is a wealth of other information that will be either new or a much-needed reminder for even experienced journalists. The third chapter, on information security, details how easily the privacy of various methods of electronic communication can be breached and provides extensive information on various encryption programs, anti-virus software and other ways to secure digital data. For example, to create a hard-to-crack password, CPJ advises to ditch a pass word and choose a “pass phrase” instead. The pass phrase should be longer than the regular eight-character password and include random punctuation and a mix of capital- and lower-case letters. Another advice is to give imaginary answers to popular security questions since the real answers (one’s mother’s maiden name, for example) may be obtained with little research by determined adversaries. Journalists working in hostile environments are advised to carry a laptop computer with minimal information and keep the more substantive work on a USB flash drive. This flash drive can be more easily hidden or disguised, while a second USB flash drive can serve as a decoy in case both the laptop and a flash drive are demanded and confiscated. Satellite transmissions should not last for more than 10 minutes to avoid tracking. The creation of a fake e-mail account where some innocuous work-related information is kept to give it appearance of authenticity may be useful should a journalist be kidnapped and forced to reveal his password. Throughout the guide, the authors reference the particular challenges faced by freelance journalists. According to CPJ, “about half of the journalists behind bars at any given time work primarily online, and about half are freelancers. Each year, those proportions grow larger.” Layoffs in the journalism industry have meant that news organizations are relying on freelancers more than ever. Free manuals such as CPJ’s Journalist Security Guide benefit freelancers in particular because they may not receive this information otherwise. But much of the guide’s good advice—spend a few weeks researching a new beat or assignment, learn fist aid, undergo security training, get health insurance, seek psychological counseling to deal with war trauma—requires a combined investment of time and money. As the authors point out, without the necessary institutional support, freelancers lack both. One hopes that CPJ’s reports raise some serious ethical questions within news organizations about what their responsibilities to freelance journalists are and that the ensuing discussions translate into greater support for those carrying out some of the most dangerous assignments.